Towards the end of his remarkable run as star and producer of the Zatoichi movies (1962-1973), Shintaro Katsu undertook the task of launching another series about an outcast swordsman. This new endeavour lasted for only six films, between 1972 and 1974, and was markedly different from the Zatoichi films. Most superficially, the Lone Wolf and Cub sextet are far more graphically violent, pushing the limits of what had been permissible in the ’60s; this was partly a reflection of the industry’s need to up the stakes as it fought to maintain its hold on a dwindling audience. But it was also due to the intrinsic nature of the material. First appearing in 1970, the Lone Wolf and Cub manga, written by Kazuo Koike and drawn by Goseki Kojima, ran for years, eventually expanding (in English translation) to more than 8000 pages in 28 volumes. Through its narrative about Ogami Itto, the former official executioner for the Shogun, and his obsessive quest to destroy the Yagyu clan which had engineered his fall from favour and the destruction of his own family, the manga created a richly detailed portrait of a particular period in Japanese history, a violent time in which classes and factions fought for social position with literal swords. Koike himself wrote the scripts for the first five movies in the series, drawing closely from the storylines, characters and incidents of the manga. The first film, Lone Wolf and Cub: Sword of Vengeance (1972), is an origin story. We are introduced to the strange, brooding character Ogami Itto (Tomisaburô Wakayama) as he wanders along the same country roads and through the same small towns and villages through which Zatoichi travelled. 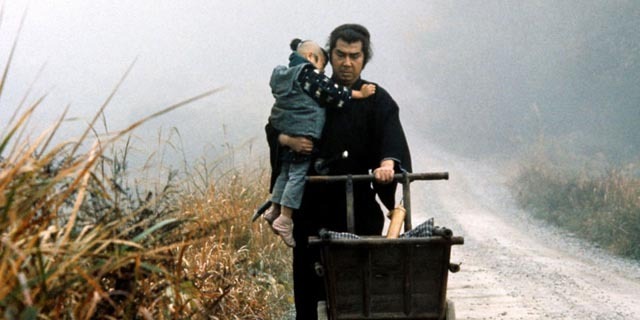 But what marks Ogami as an unusual figure is the heavy wooden cart he pushes along those roads from which his three-year-old son Daigoro (Akihiro Tomikawa) looks out at the world with preternaturally old eyes. In flashback, we learn that Ogami was framed by Retsudo Yagyu (Yunosuke Ito, played in subsequent films by Tatsuo Endo and Minoru Oki), the demonic head of a clan which covets the role of official executioner. Evidence is contrived to paint Ogami as a traitor to the Shogun and an attack on his house leaves his wife dead; Ogami is ordered to commit seppuku, but defies convention and refuses, instead fighting his way through a large number of Yagyu swordsmen and swearing a vendetta against Retsudo and his clan. In one of the first film’s quietest yet most chilling scenes, Ogami lays out a sword and a colourful ball and tells the baby Daigoro (too young even to walk) that it is the child’s choice whether he will die now and join his mother or embark on the road of demons and damnation with his father. The baby reaches out towards the sword and thus becomes Ogami’s observant companion through all the carnage which follows. On the road, Ogami becomes an assassin for hire (known as Lone Wolf and Cub) who will kill anyone for five-hundred pieces of gold, as long as those hiring him give a clear explanation of why they want someone dead. The films are episodic, their picaresque narratives revealing an underlying moral core behind Ogami’s mercenary violence. Here the dichotomy is much starker than that of Zatoichi, a man who sees himself as low and unworthy even as he sets out again and again to right the injustices inflicted on peasants by vicious gangsters and oppressive noblemen. Ogami brings the harsh sense of order he observed as the Shogun’s executioner to his role as an outlaw now opposed to a system revealed as deeply corrupt. Over the course of the six films, as Ogami carries out his paid-for assassinations, he is pursued by various factions of the Yagyu clan intent on killing him. The climactic centrepiece of each movie is a large-scale battle in which Ogami – aided by Daigoro in what becomes an increasingly weaponized baby cart – takes on small armies and destroys them. Through all this action, Daigoro absorbs his father’s steely determination; in the fifth film, Baby Cart in the Land of Demons (1973), the child is used by a pickpocket to conceal her most recent theft. When he’s taken by the authorities who are pursuing the thief, he remains silent through a savage public beating because she had elicited his promise not to betray her. The sight of his stoic resistance finally makes the thief reveal herself and own up to her crimes. Ogami witnesses all this but doesn’t interfere; Daigoro needs to be strong and independent to survive on the road of demons and damnation and despite the strong bond between father and son, the adult respects the child as an equal who must make his own way. The first three films – Sword of Vengeance, Baby Cart at the River Styx, Baby Cart to Hades – plus the fifth – Baby Cart in the Land of Demons – were all directed by Kenji Misumi, who also directed half a dozen of the Zatoichi movies (including the first). In Misumi’s hands, what might have been garish, sadistic pulp took on a poetic tone; the Lone Wolf and Cub movies are full of strikingly evocative imagery, which combines severed heads and gushing sprays of blood with serene landscapes, the human violence ultimately leaving the natural world untainted. The fourth film, Baby Cart in Peril, was directed by Buichi Saitô, who makes up for less poetry with a greater enthusiasm for the series’ pulpy elements. The film opens with a scene taken directly from chapter twenty-three of the manga, with a woman outnumbered in a sword fight in woods; stripped to the waist to reveal elaborate tattoos which distract her opponents, she kills them all. The sixth film, White Heaven in Hell, was directed by Yoshiyuki Kuroda, who has a much shorter filmography than Misumi or Saitô, his most notable previous work perhaps being the second part of Daiei’s late-’60s Yokai Monsters trilogy. The first (and in the event only) Lone Wolf and Cub movie not scripted by Koike, White Heaven in Hell is in many ways the most spectacular and deranged part of the series. With most of the Yagyu clan dispatched by Ogami, Retsudo seeks out his embittered illegitimate son; Hyoe isn’t very amenable to Retsudo’s request to take on the job of destroying Ogami, but he uses magical powers to animate three dead warriors who pursue the assassin. These undead figures can fly and burrow through the ground, adding an overt fantasy element to a series which, while extreme, had previously remained grounded in a natural world. The spectacular climax of White Heaven in Hell takes place on a snow field in the mountains. Taking six weeks to film, it involved over a hundred stuntmen engaged in elaborately choreographed combat which takes full advantage of the visual possibilities of blood spilled on pristine snow. And after the battle is over, the film has a surprisingly quiet and tender coda in which Ogami finds Daigoro where the baby cart (on skies) had crashed into a stand of trees, picks him up and sets off for a long walk into the twilight. This provides a powerful emotional ending to the series, although we are deprived of any final confrontation between Ogami and his arch-enemy Retsudo. This would no doubt have occurred in some future episode, but no more were made after this one – although the character did continue in a television series. At first glance the stocky Tomisaburô Wakayama seems like an odd choice for the character (much leaner and more angular in the manga), but Wakayama pursued the role with determination, convincing Koike that he would be the right choice, and persuading his brother Shintaro Katsu to take on the production of the adaptation. While Misumi abandoned the series after the fifth episode because he felt it was settling into a rut, Wakayama would have liked to continue; but he too walked away after the character was appropriated for the TV series, which he felt undercut the value of the features. He continued for another two decades with a busy career in movies and television. Criterion’s three-disk Blu-ray release of the complete Lone Wolf and Cub is a spectacular improvement over previous home video releases, the 2K transfers from original camera negatives colourful and detailed, the mono soundtracks robustly supporting the sounds of the films’ many fight scenes. The extras include a 52-minute French documentary about the series from 2005; interviews with writer Kazuo Koike and Misumi biographer Kazuma Nozawa; an interview and demonstration with Yoshimitsu Katsuse, a master of the Suio-ryu sword technique used in the films; and a half-hour silent documentary from 1938 about the making of samurai swords. And finally there’s a beautifully restored copy of Shogun Assassin, the English-dubbed 1980 U.S. re-edit of the first two films. I had never seen this popular movie (which fell afoul of the British video nasty panic in the early ’80s) and was surprised to discover that this reworking of the material under the guidance of producer Robert Houston was quite intelligently handled. The bulk of the movie is drawn from the second film, Baby Cart at the River Styx, with the backstory quickly sketched in with flashbacks from Sword of Vengeance. Here Retsudo Yagyu is recast as the Shogun himself, a ruler who has gone mad and turned on his loyal retainer Ogami. The layering of the social, political and familial elements of the original series is tossed aside, the new narrative built around a simpler-to-grasp primal conflict which merely paves the way for the string of violent action set-pieces. Coming in the wake of Criterion’s hefty Zatoichi set and the pair of Lady Snowblood features (based on stories by Koike), not to mention several excellent genre collections from Eclipse, the complete Lone Wolf and Cub bolsters Criterion’s increasingly impressive shelf of popular Japanese cinema. This entry was posted in Commentary, Review and tagged Action, Actors, Blu-Ray, Criterion, Directors, Historical Film, Japanese Film. Bookmark the permalink.